LL: The last time I got checked, I was right at 6’1”, I weigh 270 now and as far as my forty time, I’m not sure, but the last time I did get clocked I ran a 4.9. LL: Yes, I’m originally from Monroe, Louisiana. LL: I rooted for the Colts, the Saints, the Chargers, and as far as collegiate teams, I wasn’t so much into college football. I always knew LSU since it’s here at home. LL: When I was in the second grade I started playing flag football, and that was my first time playing. LL: Yes, I have. My father and his brother, and I’ve had uncles and so forth that played. It’s been a part of my family for a while. LL: I do track and that’s it – track and football. I don’t have time to do anything else anyway. I’m in the field events, I do shot put and discus. LAFM: Do you play any other positions besides defensive tackle? LL: My main position is still defensive tackle. I also, in certain packages we get in, play tight end and some packages I play fullback. LL: Not so much specifically. I look at them as a whole, and I know that they’re on another level than where I’m at. As a whole, no one individual though. LL: I think my biggest strength as a player is my never ending desire for this sport. There’s a fire that burns in me. As far as what I’ve been working to get better on, I’d say my get-off. Getting off the football is really what I’ve been working for the whole season. That, and becoming more and more aggressive on the inside. I used to play end and it’s a whole different ball game from end to being tackle. LL: My sophomore year I went to Alabama. This past year I went to Northwestern. LL: I have received an offer for a full ride from Northwestern and Southeastern. LL: I’m interested in Northwestern. Not taking anything away from Southeastern because I haven’t visited Southeastern yet, so I won’t know until I get there in January. They’re both showing me their attention, and I have a whole lot of letters from different colleges that have interest in me. Particularly the one that sticks out I would have to say would be Texas, Texas A&M or Tulane. LL: Yes, I want to study Business Administration and minor in Music. LL: Individual numbers, I wanted to reach past what I finished in total tackles last year, and I think I have surpassed that. As far as sacks, I still have time to achieve that. I wanted at least five sacks and I have 2 or 2.5. As far as the team goal, since I’ve been in the program for four years and I’ve been a varsity player for three years, this is our third year winning the District title and that means a lot to me. As a team, we wanted to be undefeated and that hasn’t been in done in a long time, since 1992. We wanted to set the goal just standing out from every other team that’s been through here. I feel like we’ve actually made our mark, but we’re not through. We had the ’09 season where we won the championship, we had last year where we had the lowest of lows and I think we’ve got the feel of both of them. Our ultimate goal was to take those two seasons and learn from them and use them to where we’re at now. I think we’ve accomplished that and we’re striving for it. LL: I want to tell you our first opponent in the playoffs, which we just found out was Archbishop Shaw. If we take that away, it’s just whoever is next. It’s no particular team or school at all, just whoever is my next opponent, I’m ready. LL: I harp on myself when I do bad. 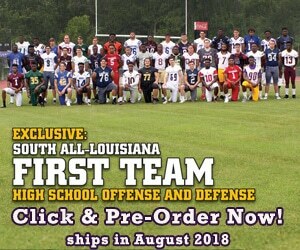 The game that sticks out to me would be the Franklin Parish game because that game I really had to learn from and I really grew from that game. The game that sticks out on top of my whole high school career would be my sophomore year playing at Lutcher. LL: My current GPA is a 3.42 and my current ACT score is a 19.